For many commodity investors, the last four years have felt like one long, bad dream. The kind where you're tied to a railroad track as a train heads straight for you -- in slow motion. You can't move, can't scream, can't do anything but lay there and wait for the point of impact. On July 29, that point seemed closer than ever when the S&P GSCI index, a measure of a basket of 24 commodities, plunged to its lowest level in 13 years. 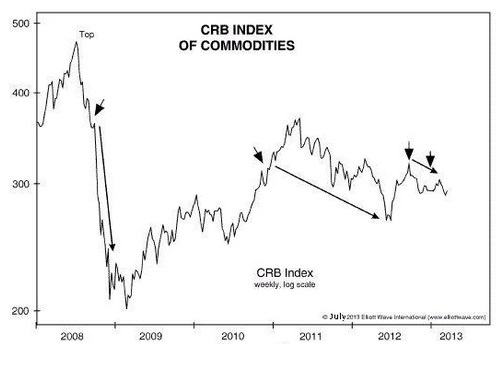 Meanwhile, the bellwether Thomson Reuters Core Commodity CRB Index dove to a 7-year low, having dropped 34%-plus since June 2014. "Driving the selloff in commodities are expectations that the Fed will raise borrowing costs in coming months, a move that investors expect to further boost the dollar and pressure the prices of commodities. "It's hard to see how the Fed would even consider hiking rates against such a weak backdrop." From our standpoint, it's hard to see how belief in the Fed's ability to re-route the commodity rout persists -- even as the facts say otherwise. Case in point: If maintaining a loose monetary policy is good for commodities, then why did the market crash 60% in 2008 -- the same year the Fed slashed rates seven times to record low of 0-.25% while launching the first round of quantitative easing? Chalk it up to a glitch, perhaps? 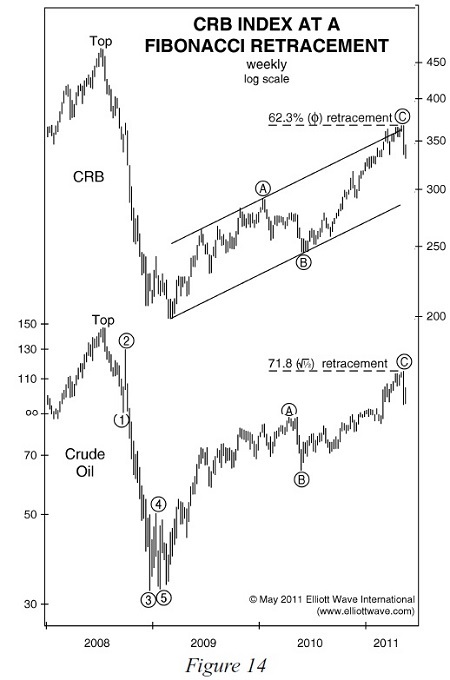 In April 2011, the Daily Sentiment Index (prepared by Trade-Futures.com) showed the percentage of commodity bulls at a record 93%. Yet -- that same month, the Thomson Reuters CRB Index peaked and turned down in the four-year long, 30%-plus bear market we see today. With all these changes occurring, the commodity rebound -- it has not been a bull market -- is probably over. I think the dollar is starting a 5-year bull market, which will coincide with a bear market in everything else." Charts tell the truth. Notice the four short arrows on the chart. Based on their positions, you might think they would mark the timing of accurate sell signals generated by a secret indicator. But there's no secret indicator. These happen to be the times at which the Fed launched its inflationary QE programs! Investors believed the Fed's QE actions would be bullish for commodities. But -- ironically yet naturally -- every launch of a new QE program provided an opportunity to sell commodities near a high. None of the believers in omnipotent monetary authorities and their pledges to inflate saw any of those changes coming. Meanwhile, we couldn't see how it could turn out any other way. This eye-opening complimentary report, which represents more than 10 years of research, goes beyond the Fed's history and government mandate; it digs into the Fed's real motivations for being the United States' "lender of last resort." This article was syndicated by Elliott Wave International and was originally published under the headline The Fed Can't Stop the Commodity Bear Market. EWI is the world's largest market forecasting firm. Its staff of full-time analysts led by Chartered Market Technician Robert Prechter provides 24-hour-a-day market analysis to institutional and private investors around the world.